Boeing’s $1 billion composite wing center (CWC) will start fabricating the first spar for the 777X wing this year, marking the start of a process of composite wing making on a scale never before tried in a commercial aircraft program. Inside the 1.3-million-square-foot building in Everett, Washington, a single autoclave over the past year has baked composite parts for preproduction test articles such as stringers, panels and wing skins, in preparation for low-rate production and assembly at Boeing’s adjacent horizontal build line. Speaking with AIN just before the start of the Paris Air Show, 777/777X operations vice president Jason Clark described the process of building the world’s largest composite wing, starting with the testing of each preproduction part for what he called ultimate process control and design integrity. “We’re on track to be producing the first articles this year,” said Clark. “Within the year we will have in production multiple components for the wing to support the overall integrated schedule.” That schedule calls for primary assembly of components in 2018, first flight in 2019 and the delivery scheme in 2020. The CWC now houses all the tooling necessary for initial low-rate production, said Clark. As the rate increases, the plant could eventually carry tooling capable of keeping pace with a rate of 8.3 airplanes per month. Now performing final qualification tests for the wing’s composite spar, Boeing expects to soon start making that part for the first 777X, a static test airplane. The 105-foot-long component is the largest single-piece spar ever produced. For the 787, for example, Japan’s Mitsubishi assembles a spar from three pieces, mainly due to transportation logistics. “It’s one of the key reasons that we actually do all the fabrication next to assembly at the Everett site,” said Clark. Although it now houses a single autoclave, the CWC will eventually need three for full rate. For spar production, Boeing has erected two fabrication cells, allowing it to build a front and rear spar simultaneously. 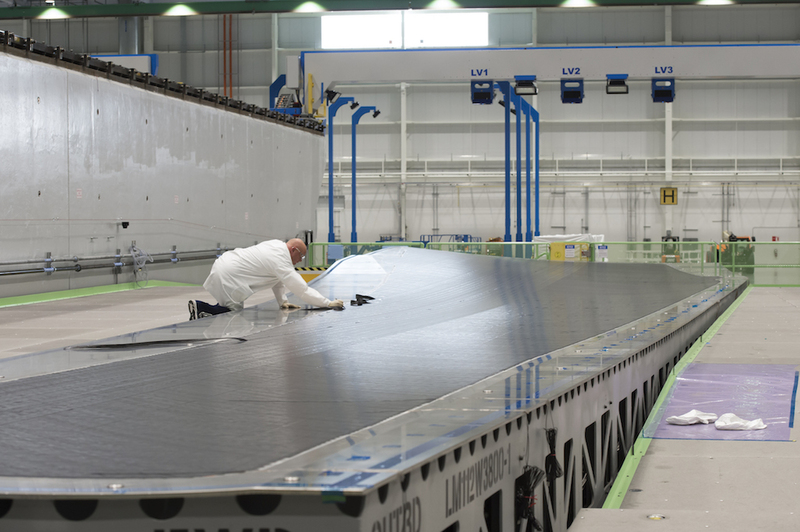 While the CWC also makes composite panels, skins and stringers—86 of which go into each wing—the wing’s aluminum ribs are made in other Boeing facilities, said Clark. The 777X’s distinctive wingtips get built at Boeing’s factory in St. Louis, along with most of the leading and trailing edge components. One of the airplane’s most visually distinguishing characteristics, a 12-foot-long folding wingtip will allow regulators to classify both airplanes as Code E, meaning they’ll fit into the same size parking space the 777-300ER now uses. All of the wing’s components come together in what Boeing calls the horizontal build line, in an automotive-style process the company has used for some time with the 737 and 787. As opposed to the company’s traditional vertical build method, in which the wing sits in hard tooling upright from its trailing edge, the horizontal method allows the design—as opposed to the tooling—to control the configuration of the wing, explained Clark. The arrangement carries ergonomic benefits as well as easier access for workers. “And there’s a lot more flexible tooling that you can put into the wing using that approach,” noted Clark.